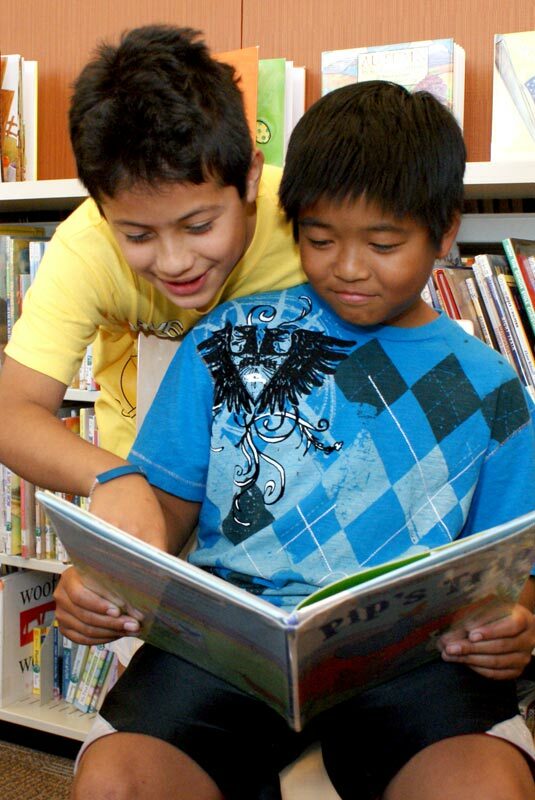 One of the most frequently asked questions we hear at Canyon Country Library is, “How do I find AR books?” This is tough for us to answer because the reality is that a large majority of our books in the children’s section are AR books. We follow the traditional system of organizing books by author’s last name and Dewey Decimal number, though, not AR level. This, of course, means that all the AR levels are mixed up amongst our shelves. Therefore, we cannot simply lead you to one section. Finding appropriate AR books in the library takes time and patience so my first bit of advice is to come with 10-15 minutes to spare looking for books. My second bit of advice is to seek out a children’s librarian. At Canyon Country, this would be Shannon or Angie (me!). We have a lot of experience with this question, and, while we won’t be able to immediately put a book in your hand, we will be able to ask you the right questions to steer you in the right direction. The front reference desk is not always staffed with children’s team members. Most of the questions at that desk are adult-based questions so you may be disappointed with the help you get from that desk. We cannot guarantee when children’s team members will be at that desk. It is not absurd to ask the front reference desk for help finding a children’s librarian, though. They can find one of us, and we are happy to help as long as we are not in the middle of a storytime. There’s nothing I love more than putting a good book in a kid’s hands. Many parents come to us with a list of books printed off the AR website. The problem with this method is that we cannot guarantee that any of those books are on our shelves. They may be checked out at the moment, or we might just not carry them at all. If you are hoping to get a book to put in your child’s hand that very day, this is not the best method. I have helped parents with lists 20 books long, where only 1 book on the list is findable that day. The best method we have found so far is to simply have your child pull a handful of books that he likes off the shelf and then check the AR level of each of them. This can happen in a few ways: 1.) You or your child can use one of our computers to go to ARbookfind.com, 2.) You can use the library’s free wifi to access that site from your phone, 3.) You can download an app onto your phone, such as LevelFinder, BookScanner, etc. 4.) You can wait at a library reference desk and politely ask someone to check the levels of a few of your books (please no large piles!). One handy tip I use to help me lead kids in the right direction is to start by asking the kid what the last book he took a quiz on was. I also like to ask what his favorite book is. These questions can usually head us in the right direction. I am completely aware that kids can be more forthcoming with this information when talking to me than mom or dad. Sometimes, mom and dad are the enemy if the kid doesn’t feel like picking out a book. Please, bring that kid straight to me. I’ll help without the hassle of fighting in the library. 1.0 – 1.9 level = Many of these books will be in the I Can Read or Easy Reader section. These are those thin books that teach kids beginning sentences. In Canyon Country Library, they can be found beneath the large painting of the tree on the wall. The Fly Guy books by Ted Arnold and the Pinkalicious books by Victoria Kann are good examples of these. If you’re looking at the numbers on the spines of the books, the #1 books should fall in this category. 2.0 – 2.9 level = Many of these books will be in the I Can Read or Easy Reader section as well. The Fancy Nancy books by Jane O’Connor and the Amelia Bedilia books by the Parish family are good examples of these. If you’re looking at the numbers on the spines of the books, the #2 and #3 books should fall in this category. 3.0 – 3.9 level = Many of these books will be in our paperback series section. This level is for many beginning chapter books. The Judy Moody, Magic Treehouse, My Weird School, and Junie B. Jones series are great examples of these. 4.0 – 4.9 level = These are the bigger chapter books. Many of these are still in our series section, such as the Geronimo Stilton or I Survived series. A lot of our fiction books in our hardcover shelves fall in this category too, such as the Dork Diaries series, the Origami Yoda series, and the Percy Jackson series. 5.0 – 5.9 level = Most of these are in our hardcover fiction section, but you can still find a few in our series section. “Hoot” by Carl Hiaasen and “Hunger Games” by Suzanne Collins are examples of these. We normally do not get requests for higher level books. We find that as the kids progress in school, they get really good at finding their own books. Also, they start reading much longer books so they don’t need as many AR books in order to earn all their points. For all you panicked parents who are new to AR, I want to assure you that it will get easier. Trust that your kids will start becoming mini experts in how it all works. We are here to help in any way we can. We are not experts in how AR works and cannot answer many questions about how the quizzes work because we do not work for the school system. But, we can help you find the books you need and are happy to play a part in making your child a better reader. I am a children's librarian at SCPL's Canyon Country Library. My favorite things are funny books, ice cream, and the Matterhorn at Disneyland.